We all know that the long term costs of nuke power are huge, but now the truth comes out...they don't even make sense now. Vogtle is starting to admit the cost overruns. Note that historically, cost overruns of 250% are the norm. Even at the original budget, Vogtle would have only returned 1.666% annual rate of return on investment. No investor wants that, that is why they force the ratepayers to pay now, to become captive "investors". It simple, because they can't find any real investors who want to take the deal. Who wants to invest in a project? You have to pay your money now, and then in 6 to 8 years, then we will start paying you back at 1.666%. Unless there are cost overruns, which must then chip in more money, whatever we tell you. And if you don't pony up, we just stop the plant and you lose all your money. OK who wants this deal? 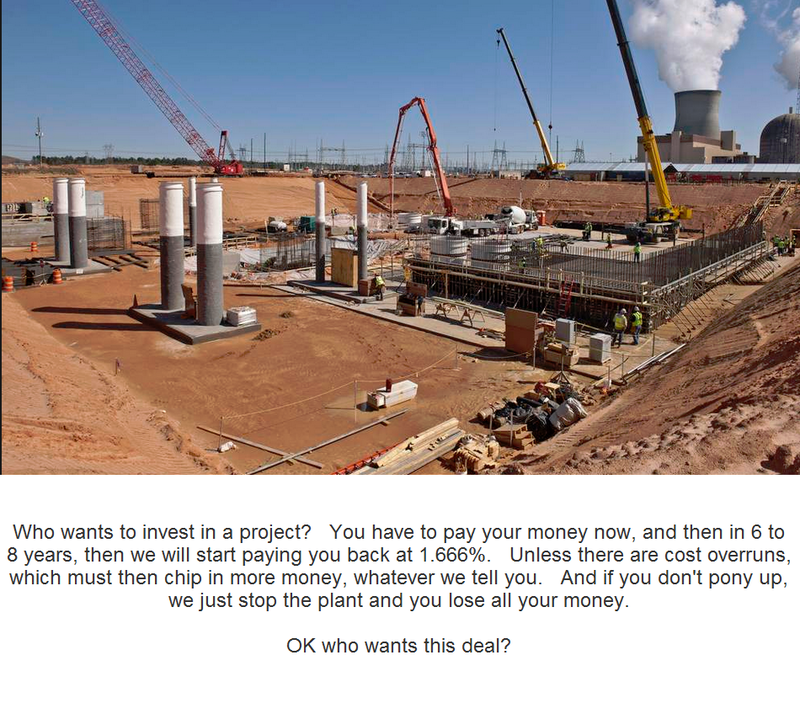 ATLANTA — As the cost of building a new nuclear plant soars, there are signs of buyer's remorse.